In 1999 the Western Railway Headquarters building at Churchgate in south Bombay celebrated one hundred years of its existence. Although many perceive this Grade I heritage building as an important landmark on the citys skyline, on account of its location at a busy intersection it is often passed by unnoticed in the waves of humanity that has come to characterize the Churchgate station area. Through its history, however, this edifice has evolved as an important icon of the role of the railways in the city, an instrument that has in many ways fuelled Bombay6s commercial, industrial, financial, social and cultural life and history. This building has served as a visual or symbolic anchor to the north-south lifeline of the city, a lifeline that has literally structured the shape, patterns of growth and the very sense of mobility in the city. In fact, the Western Railway over time has welded together the entire metropolis Greater Bombay! To tens of thousands of citizens who commute each working day between their homes and workplace, the line and its anchor symbolize their very livelihood. The rail commuters travel from as far afield as Virar, the last northern station on the Western Railway suburban line, located at a distance of 59.98 kilometres (39 miles) from Churchgate station, the southern terminus on the island city of Bombay. In between the two stations, beginning from Churchgat4e lie 26 stations making a total of 28 on the line. These are marine Lines, Charni Road, Grant Road, Bombay Central, Mahalakshmi, Lower Parel, Elphinstone Road, Dadar, Matunga Road, Mahim, Bandra, Khar Road, SantaCruz, Vile Parle, Andheri, Jogeshwari, Goregaon, Malad, Kandivali, Borivali, Dahisar, Mira Road, Bhayandar, Naigaon, Vasai Road, Nalla Sopara. Each name has an exotic ring and suggests the existence of many different communities, settlements, religious sites and places all strung together like variegated beads in a necklace, collectively creating even more vibrant synergies. Each station has indeed had a fascinating history. At one time many were part of tiny gaothans or villages, others were built in clearings of forests or in the midst of palm oarts and vast acreage of paddy fields and salt pans and a few were ancient centers of pilgrimage. 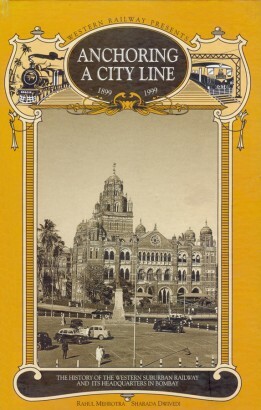 The coming of the line, the Bombay, Baroda & Central India Railway, now the Western Railway, resulted in a complete transformation not only of the island city, but more evidently also of these suburban areas and finally in the way they were connected and coalesce together to form the metropolis of Bombay.